The Dunes are located in southern Colorado in the flat San Luis Valley. As you approach the dunes from a distance, they suddenly appear and seem totally out of place, nestled against the rugged Sangre de Cristo Mountains. 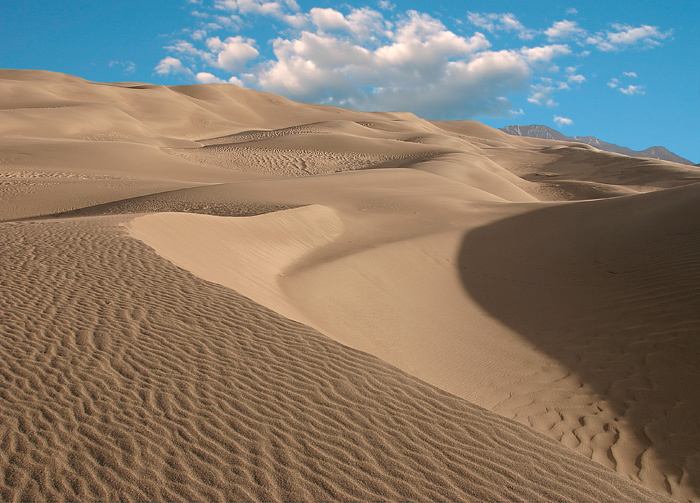 The 35 square miles of dunes reach elevations of over 700 ft, which makes them the tallest dunes in North America. The dunes were formed by westerly winds that pick up sand and then deposit the sand on the valley floor just before the wind can rise and clear the mountains. Photo © copyright by Mike Barton.